International Campaign for Human Rights in Iran: Governments Should Blacklist Human Rights Violators! The International Campaign for Human Rights in Iran urged governments from around the world to blacklist officials of the Islamic Republic of Iran implicated in grave human rights violations, thus recognizing their role as perpetrators in Iran’s grave human rights crisis and making it impossible for them to travel and keep assets abroad. The Campaign is urging the governments of Canada, Malaysia, the United Arab Emirates, Thailand, and members of the European Union in particular, countries in which known Iranian human rights offenders are most likely to hold assets or travel, to institute asset freezes and travel bans against them. The Campaign welcomed an announcement by the United States government on 29 September 2010, naming eight top Iranian government officials as targets of such financial freezes and travel bans. “Members of the international community can and should blacklist those Iranian officials responsible for grave human rights violations of their citizens,” said Hadi Ghaemi, the Campaign’s spokesperson. “To do so sends a loud, clear and constructive message that these crimes will not be tolerated, and that the international community will do all it can to combat the endemic impunity in Iran, ” he added. 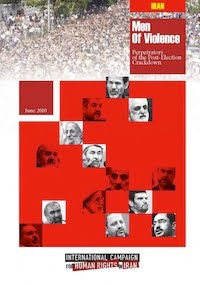 In June 2010, the Campaign published “Men of Violence: Perpetrators of the Post-Election Crackdown,” a report naming fifteen Iranian government officials and supporters implicated in gross human rights violations against Iranian citizens. The eight individuals sanctioned by the US government are: Mohammad Ali Jafari, Commander of the Islamic Revolutionary Guard Corp (IRGC); Sadeq Mahsouli, current Minister of Welfare and Security and former Minister of the Interior; Gholam-Hossein Mohseni-Ejei, current Prosecutor General of Iran and former Minister of Intelligence; Saeed Mortazavi, former Prosecutor-General of Tehran; Heydar Moslehi, Minister of Intelligence; Mostafa Mohammad Najjar, current Minister of the Interior and former Deputy Commander of the Armed Forces for Law Enforcement; Ahmad-Reza Radan, Deputy Chief of Iran’s National Police; and Hossein Taeb, current Deputy IRGC Commander for Intelligence and former Commander of the IRGC’s Basij Forces. Mohammad Reza Naghdi, Commander of Basij Forces. Ahmadinejad a cheater and a lier and a person who has ordered the killing and torturing of innocent Iranian young women and men! Mr. Mohammad Sadegh Larijani the head of judiciary power:"Outbreak of lies in Iranian society" ! 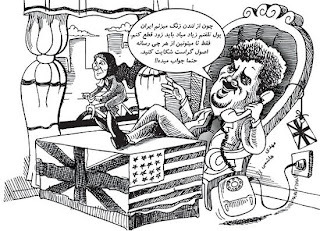 Last week when Ahmadinejad was in NY , jurnalists asked him about the stonning sentencing of Ms. Sekineh Mohammadi ashtiani , his answer was: "This is not true." Now Mr. Ejeei the prosecutor general of Ahmadinejad in an interview said: "About Ms. Sekineh Ashtiani ,yes such a sentencing was issued( stonning was issued) ."!? See the video clip in next post . Since the presidency of Ahmadinejad the division and clashes among Islamic officials has intensified ! 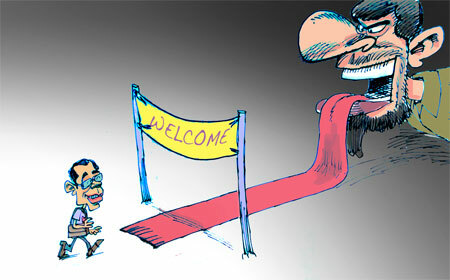 This cartoon was published by "Fars" newspaper (people call it false newspaper). This newspaper supports Ahmadinejad and his Government despite of sharp criticism against his government. 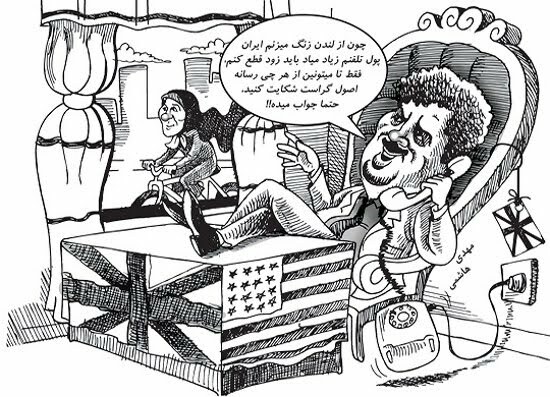 The cartoon shows Mehdi Hashemi ( on phone)and his sister Faezeh Hashemi (on bike). They are the son and daughter of Hashemi Rafsanjani the powerful Islamic Republic personality. Mehdi Hashemi saying on the phone that; "because i'm calling from London and the phone bill will be hi ,i have to cut it soon , but if you can make more complain against principalist "osulgra" media, it will work "
U.S has made new financial sanction against eight Islamic regime officials who had commited crime against humanity !!!! Eight officials of the Islamic regime in Iran who have helped Ahmadinejad in the coup d'etat and ordered their forces to kill or tortur people in the controversial "Kahrizak" prison , have been sanctioned financially and on travel /visa permision by the Obama Government. Khamenei's conduct on election & his support for Ahmadinejad brought new discussion:The assembly of expert must observ,control and remove him ! After revolution, the "Assembly of Expert" or "Majles Khebregan" was set by Khomeini the founder of Islamic Republic which gives power to its member to control ,remove or appoint new leader. After the controversial last year presidential election ,Khamenei the current leader supported Ahmadinejad and called him as the winner despite of obvious cheating and protest of close to 4,000,000 people just in Tehran. His action supporting Ahmadinejad who is famous for his big lies and cheating and who has ordered his forces to shoot people in the streets and killing more than one hundereds young Iranian women and men who were chanting peacefully asking " where is my vote"brought anger among Iranian people. Mr. Karoubi the past speaker of the parliament and presidential candidate running against Ahmadinejad called the Assembly of experts to do their job on observing the leaders conduct and in recent weeks he has brought sharp criticism against Assembly of experts for not doing the job they have to do. Mr. Karoubi have emphasized that the assembly of experts "on supervising the leader " . He said : Khomeini the founder of Islamic Republic believed that ;"the most deviation from the course would be the deviation by leader itself ( leader to change course ). This brought a newly meeting of the members of "Assembly of experts" . The head of A o E is Ayatollah Rafsanjani one of the most powerful personality and the right hand man of Khomeini the founder. And now, Grand Ayatollah Ali Mohammad Dastqeib one of most respected and followed Ayatollah and personality in the Islamic Republic have said: "The leader is not the absolute leader /guardian and he does not have any rights over people"
This kinds of debate will continue among the society and Islamic personalities as long as Khamenei continue supporting Ahmadinejad and his lies and not returning to the path of truth and listening to people . 1- After months in waiting and close to two years imprisonment, Hossain Derakhshan was sentenced to 19.5 years in prison by judge Salavati in division number 15 of Islamic Revolution court .A source close to the family told "International Human Rights Campaign" (an Iranian human rights group in USA) that the family and lawyer did not know about the sentencing , they only red it through internet.The sentencing news came from a website known as the " Mashreq" meaning East. But a close source to the family told to IHRC that the sentencing is true and the family are in shock.This conservative website called Hossain Derakhshan as a counterrevolutionary weblog writer. According to the website Mr. Derakhshan or Mr. Mahdavi his lawyer can protest to the sentencing , so that it can be reviewed in appeal court. First time after his return and arrest , Mr. Alireza Jamshidi on January 2009 the spokesperson for the judiciary power confirmed the arrest of Hossain derakhshan. According to some reports Mr. derakhshan is being held in ward number 2A of "Sepah" in Evin prison. His mother Azra Kiarash pour last year wrote a letter to Sadegh Larijani the head of Judiciary power and asked his son's situation be cleared. Early last year Ahmadinejad through his office, asked judge Said Mortazavi to give every rights to Hossain Derakhshan to defend himself. On September 20 report indicated that; Tehran prosecutor Mohammad Jafari Doulatabadi has requested the judge for sentencing Mr. Derakhshan to death , but judge did not approve the request. Hamed Derakhshan the younger brother of Hossain Derakhshan told to Radio Farda that " We do not know yet what are the charges against Hossain"
hossain Derakhshan has double citizenship, aside from being Iranian , he is also holding a Canadian passport and is a Canadian citizen. Canadian embassy said: Until the family decide not to aske Canada to do something for him , we can't do anything. Hamed said; Canada must do anything for him and not to wait for the family to ask help. Mr. derakhshan's weblog was not upto date since October 2008. Mr. Derakhshan's family are very close to the Khamenei's circle. After 2 years in prison Hossain Derakhshan was sentenced to 19 .5 years in prison! Hossain Derakhshan the controversial blogfather who went back to Iran almost two years ago by an invitation of Ahmadinejad's office to work as the head of foreign section of the Press TV ( an Islamic Republic English TV station ) was arrested and detained and today according to the news judge Salavati in a closed court sentenced him to 19.5 years in prison. Hossain Derakhshan's marriage ceremony was performed by Khamenei the leader of the Islamic Republic.According to the news, Hossain Derakhshan's father is a business man in Tehran historical Bazar and has many influence over businessman there and Bazar was and is the economic backbone of the the clergies who were involved in the revolution almost 32 years ago. Despite of his controversiality and the reason behind it, IRAN WATCH CANADA defends Hossain Derakhshan's rights to a fair and just trial , what has took place seems unfair and is more a political game .Hossain Derakhshan must have all the rights to appeal against the decission made by judge Salavati sentencing him to 19.5 years in prison. "The Hostile Government Dependents, wake up"
Those who were formerly receiving salary from Mr. Mehdi Jami are shocked by his expelling from Radio Zamaneh and they speak in a way as if Radio Zamaneh was the will from Mr. Jami's dad and these foolish Dutch – who doesn’t understand at all the value and importance of Iran’s culture and art and Mr. Jami’s historic central role in it- And without any reason and logic they let Mr. Jami go, therefore Radio Zamaneh which was the most independent and most important media in the whole history of Iran ( At least from the view points of Mr. Jami’s friends of Mashhad) it has fallen in the hand of malicious and irreligious ignorant foreigners and the worst of all non Mashhadi's . Holland is one of the close allies of America in the European countries and is part of a few countries of the world that imposed sanction, much more than UN security council against Iran. Oil sanctions and technological and even scientific sanction on Iranian students in Dutch University’s which didn’t even happen in America. The Government of Holland that had no media in Farsi language, came to this conclusion that for having an impact inside Iran and for its own political interest, specially among the youth and students it needs media. The Foreign Ministry of Holland approved tens of millions Euro budget in order to create several media project in Farsi language. Except America, the only country in the world that has approved budget for Iran under this agenda , is America. Press Now Institute, has extensive experience in creating anti Russian and anti left Radio in Eastern Europe and the former colonies of Holland in Africa .After the invasion of Afghanistan it has become active in this country , it has been asked by the Holland Foreign Ministry to create the most expensive Holland media project in Iran. Among candidates who have given application for employment to "Press Now Institute" , Mehdi Moazen Jami was selected because of his opinion that attract youth and was fresh to Radio and website and his connection and friendship with reformist journalists inside Iran. He was put in charge of creating and managing "Radio zamaneh" under the supervision of the board of Press Now. It is funny that “The Dependents” of Mr. Jami in a single night learnt that; Radio zamaneh with a “Foreign” manager won’t be trustworthy and independent and therefore to hold the funeral service for the past beautiful Zamaneh ( and of course with the thousands of Euro as free cash they were receiving) . They have forgotten that; Zamaneh news has been managed by a well known group with the name of “ Republican unity” and Jami himself in the early months of his work in Radio Zamaneh, was one of the guest invited and participated to the congress of the “Republican Unity “ in Europe and sat beside "Radio Farda" at the media panel. Showing as if didn't know the position of Radio zamaneh on Iran’s atomic programs in recent years which was coinciding exhaustively with the position of the government of America and her European allies. They have forgotten that it was in this beautiful, independent and compatriot media*5 which published advertisement report for the terrorist "Jondollah group"*6 and started various campaign against the judiciary system and punishment for one of its official member. They have forgotten that, at the time of this same nationalism bourgeois legend , meaning Mr. Jami, Radio Zamaneh have given special programs and tribune to the secessionist Kurdish groups and has entered officially into the new project of America for creating dispute among racial and ethnic in Iran. Whom are we going to deceive? Mehdi Jami with a middleman of the Holand Ministry of Foreign Affairs for creating a website, Radio and perhaps later Television was the closest ally of America in Europe for inside Iran. All the several millions budget of Radio Zamaneh has come directly from the Holland Ministry of Foreign Affairs and Radio zamaneh never had an independent policy from Holland Government, never was impartial and even for a moment the interest of Iran wasn’t important for him. The journalist friends of reformists who have kept their heads into the snow and think that; media that receives all its money from a government can be independent, is better not to deceive themselves more . This very BBC Persian TV which is going to be started and "water has already flow from the chops of many of you" ( made many hungry ) , also receive all its expenses from the Government that, with economic sanction wants to destroy the family’s and people of your country. Don’t sell your honour and dignity and when you have learnt the work go back to Iran. The atmosphere of media in Iran never been this much open and there are work and position in Iran for all of you. Even though a bit harder than BBC but instead you won’t be suffering by once own conscience. Ahmadinejad a person of interest for International court for crime against humanity ! There is no question that Ahmadinejad is a criminal by commiting crime against his own people, killing at least 100 young man and women, wounding so many and torturing as many as 10,000 Iranian in prison just during the last uprising against election cheating and coup d.etat. There is no question that he is a contradictory and conflicting person. He has so many faces and can't be trusted,but the irony is that he can seat straight and look at the person who interviews him and say crooked or lie about everything that is not in his benefit or divert the question and make million's of people around the world angry. During the interview with Larry King of CNN he said : "He is against killing!? wow , really ? where he has been ? what year and age he lives in ? does he think people of the world are that stupid and uninformed? Today upon his return from US to Iran he said: "That US was and is a bully, what about your Government during its 6 years of office Mr. Cheated "Pe-residen"t? He speaks about violation of human rights in other countries , what about violation of human rights in Iran and under your own government? And now he is asking for a truth and fact finding committee to look into the 9/11? The people of Iran are not interested , what they are interested are the freedom they dont enjoy , the release of thousands of political prisoners in Iran. They are interested in free election.They are interested in justice , human rights and freedom of expression and of course change in their living standard . Protest against the bill for polygamy & temporary marriage introduced by regime in Iran.Support"One Million Signature Campaign"against the bill ! The destructive policy of Ahmadinejad for inside Iran is more dangerous than the outside one ! Ahmadinejad and his ministers who follow a few fundamentalist ayatollah's including Ayatollah Mohammad Taghi Mesbah Yazdi, ayatollah Mohammad Yazdi, Ayatollah Ahmad Khatami and Ayatollah Janati , believe that "Imam Mahdi -the 12th Shiite Imam" won't appear from his absence if the world is in stable and peace. Therefore, they believe , they must create choas inside and outside Iran so that "The 12th Shiite Imam" will appear. This is exactly what he pray before his speeches or before answering any questions of reporters.He believes that "Imam Mahdi " is with him everywhere he goes. As the head of government for almost six years, Iran's internal situation is worsen. The minorities living in provinces like Zahedan & Baluchestan, The minority Arab population in Ahwaz ,Abadan Bushehr and Khozestan , The Kurdish people of Kurdistan, The Turk in Azarbayejan , The armanian , The Bahai's , The sufi's , The jewish and now the sunnis are all under his reppressive government. Day after day the unity among Iranian which remained strong for centuries are now weakened in a way that it reached to its weakest and breaking point. I can see the sign from now, looking at Baluchestan for example, continouse bombing ,killing of baluchi people, will create hateret among Sunni Baluchi's against Shiite,will motivate their feeling for revenge. The same situation is in Kurdistan , bombing and execution of Kurdish people and depriving them of same treatment as in other farsi language spoken part. These goe's for others too. Iran is at the verge of collaps, socially, culturally, economically and geaographically. Secession of Iran is a serious matter we the Iranian must not allow to happen . Ahmadinejad and his Ministers together with those ayatollah's must be stoped before it is too late. Ahmadinejad does not represent Persia or Iran and Iranian people , he is representing the Islamic regime in Iran! Ahmadinejad does not represent persia or Iranian people as the media tried to portray him, but it is the Iranian people who pay the price for what he says and what he does in the international meetings. He did not bring anything but shame to Iranian people.This year when he delivered his speech, more delegate from other countries left the meeting in UN general assembly in a way that half of the seat were empty.This is because his stupid speeches about denying holocaust, destruction of Israel and talking nonsense in the past and now yet another controversial comment made by him, saying ; US made up the 9/11 and is behind the killing of its people. I don't know what he is trying to achieve from this kind of speeches and diplomacy. These last few days ,Iranian people everywhere were glued to their TV's and wondering what Ahmadinejad will do or say to cause new trouble. And there, he blamed US for killing his own people in 9/11. 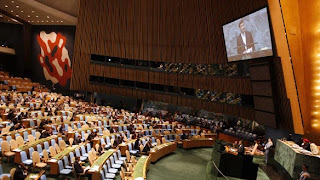 Canada boycotted a speech by Iranian President Mahmoud Ahmadinejad to the UN General Assembly on Wednesday evening, protesting his denial of the Holocaust and verbal attacks on Israel. The Canadian delegation, led by Foreign Affairs Minister Lawrence Cannon, walked out at the start of Ahmadinejad's address. Several other delegations, including lower-level U.S. diplomats, left during the speech. 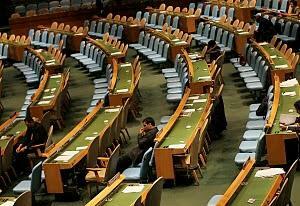 Israel's UN delegation was not present for the speech. Ahmadinejad's address to a half-empty chamber in New York slammed Israel and railed against the West and capitalism. Media and UN members should boycott Ahmadinejad! This is the only way to expose his charlatanism,lies and fallacy. Iran's Street Working Childeren,According to Stat Iran there were more than 2.5 ,000,000 working childeren in Iran in June 2010 ! Regime's reaction to defected diplomates: The defected diplomates have mental problems! "The Ministry of Foreign Affairs must look carefully about making decision on selecting its foreign diplomates and use the bitter recent experience in selection of its diplomates. He added: In my opinion some of these diplomates have mental problems and the personal, individual and material problems are the reason behind their assylum seeking." Political prisoner Arjang Dawoodi is on his 64 days of hunger strike! Political prisoner Mr. Arjang Dawoodi's life is in great danger and his weight has fell to 35 kg. Report says that ; while unconscience he was talking about death. He is in "Rejaei Shahr" prison. In protest for cutting his phone and for confiscating and selling his home by Ministry of Justice he continue his strike. He also made a complaint against "Haj Kazem" the head of Rejaei Shahr prison. Arzhang Davoudi launched his hunger strike to protest the great pressures inflicted on him. His demands include [rights] to standard telephone conversations and visitation. He also demands that his complaint against the head of Rajai Shahr prison Ali Hajkazem be investigated. Arzhang Davoudi also stressed that his confiscated house should immediately be returned to him by the judiciary so that his family is not stranded. 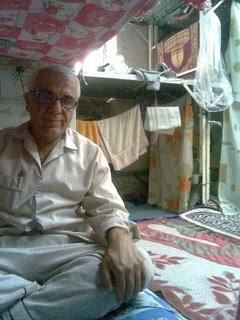 LATEST UPDATE September 15, 2010: Arzhang Davoudi has entered his 64th day of hunger strike. His health is severely critical. It is reported that the risk of death for this educator is high: http://persian2english.com/?p=14267Arzhang Davoudi who has been on hunger strike for over two months, and as a result is hardly able to speak or open his eyes, was transferred to the clinic at Rajai Shahr prison on September 14, 2010. Despite Arzhang Davoudi's extremely severe condition, at the clinic he was placed under pressure to sign a form which would assign him all responsibilities for the consequences of his hunger strike. He refused to sign the form while insisting to continue his hunger strike until all his demands are met.Arzhang Davoudi went on hunger strike over two months ago in protest to the denial of his right to make a phone call and the stalling of his lawsuit against Ali Hajkazem, the director of Rajai Shahr prison. Davoudi has also stated that if his case regarding taking back his home and stopping his family from becoming homeless does not move forward, he would take his case to international tribunals.The Davoudi home was confiscated and sold by the judiciary on the order of Judge Haddad who was presiding over the case at the time. Sometime ago, Arzhang's wife Nazanin Davoudi stated in an interview with Radio Farda, "Our home was our place of residence and a school where the cultural-educational center of Parto-e Hekmat was located. There were students studying at this place, but the residence was confiscated and its doors were sealed. "Arzhang Davoudi was arrested and has been in prison since November 9, 2003 on charges of "acting against national security" and writing the "Manifesto of Secular Iranians." 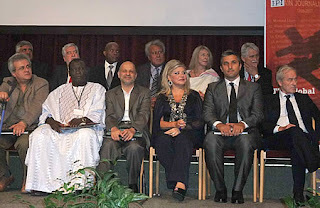 To UN members and General Assembly on 23rd of September 2010! Iranian in North America has organized a protest rally against the presence of Ahmadinejad in UN on 23rd of September 2010 from 2 to 5 pm in front of United Nation. Ahmadinejad isn't the legitimate representative of Iranian people! He has ordered his forces to commit crime against humanity by killing more than 100 innocent Iranian people ! He has no respect for human rights ( He ordered his security agents to confiscate the Noble peace prize award given to shirin Ebadi ), hundreds of human rights advocates are currently in prison because of his policy! He incite hate and war ! With all these , still you want to seat and listen to his speech! Oh, did you know that he is a lunatic too! Dear Member of the United Nations; In the name of humanity, and in keeping with your obligations to the UN Charter of Human Rights, We the undersigned ask that you take a stand against Mahmoud Ahmadinejad, the head of a regime that has consistently repressed the Iranian people, that is in flagrant violation of UN resolutions, that has supported international terrorism and endangered world peace. We the undersigned request that you refuse to honor Ahmadinejad’s presence at the UN by boycotting his speech to the General Assembly. This act will reaffirm your rejection of violence and repression against millions of Iranian people. It will also be a message to the Iranian people that they are not alone in their quest for freedom and justice. It will show the world that members of the United Nations are truly committed to the humanitarian principles underlying the creation of this respectable body – that incarceration without cause, torture and murder of innocent people, and atrocities of any kind will not be tolerated by the international community. 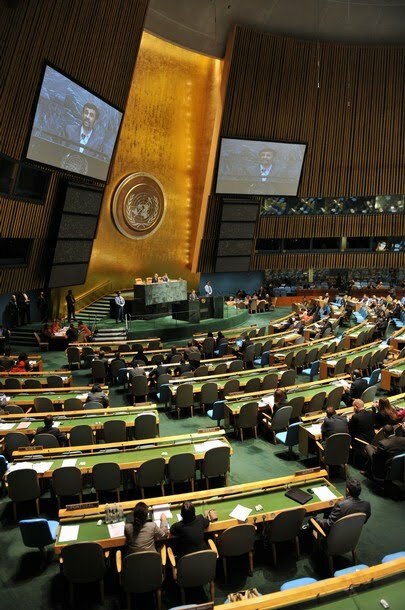 As legitimate representative of your people, we urge you to walk out of the General Assembly when Ahmadinejad mounts the podium to address the delegates. Thank you. Mr. Farzad Farhangian is one of the Diplomat of the regime in Norway who have resigned from his post in protest to the crime commited by the regime against people. He has appied for assylum from the Government of Norway. He said in an interview that: "unfortunately the policies of the regime has been shifted during these recent years and we have no choice except to separate ourselves from them." Unfortunately the election was planned and in a way ugly and then those killing and reppression on people, people who were having a peaceful march, they were just asking the government to respond to what had happened,and the response was bullet and baton and beating , presuming the nation as fool , deceiving the people and plundering the wealth of the nation , these are not sin , these are crime and we do not want to be part of these crimes." Mr. Farhangian and his wife are worried about their situation and their families living inside Iran , they are also worried about the terrorism the regime might carry against their life and their families inside Iran. Mr. Farhangian said: With us resigning , this means the regime has lost its legitimacy among its cadre's. Mr. Mohammadreza Heydari also a diplomat resigned from his post said : "More than 80 per cent of the cadre inside the Ministry of Foreign Affairs thinks the same as Iranian people and the fall is not only in Foreign Affairs, it is also among militia ,national Guards and other ministries and........."
Mr. Farhangian said: "More than 90 per cent of our colleagues think like us , but everybody has their own way, to resign from a 30 years carrier is difficult........"
Then when Mr. Farhangian attended to the UNHCR office in Norway,and sat beside another African refugee , in a response to a question that you can't go back to Iran anymore, said: Why not , we will go back in a free Iran. More diplomat are resigning. Diplomates Mr. Farhangian,Mr. Heydari,and Mr. Alizadeh no longer want to be part of the crimes commited by the regime! Torture, forced confessions, and a kangaroo court. That's what jailed Iranian student activist Abdollah Momeni claims he experienced since his detainment and jailing last year in an extraordinary letter he wrote to Iran's Supreme Leader Ali Khamenei from his jail cell in Tehran's notorious Evin prison. "Beatings, verbal abuse and degradation, and illegal treatments started at the very moment of my arrest, Momeni wrote in the letter published on the website of International Campaign for Human Rights in Iran, or ICHRI. "From the start of the interrogations, I was forced to write against my friends and those close to me. I appeared in court despite the fact that I was not allowed to have a lawyer of my own choosing representing me....my testimony was dictated to me by my interrogators beforehand," he continued. Aaron Rhodes, ICHRI's policy advisor based in Hamburg, Germany could not provide Babylon & Beyond with details on how the group received Momeni's letter. But he insisted its contents were "authentic." Momeni says he felt compelled to pen the letter after he learned about the supreme leader's remarks in a recent sermon in which he spoke of the "importance of opposing injustice and the need to observe fairness." That same day, said the jailed activist, "I decided to write a letter addressed to you, thinking that perhaps the news about detention centers does not reach you." His letter comes fresh on the heels of another similar note written by a political prisoner to Iran's chief prosecutor. In his letter, Hamzeh Karami, editor of a reformist news website, before his detainment following last year's disputed June 2009 election, claimed he suffered physical and mental abuse in detainment and that he was tortured into making a confession that he had sexual relations with relatives of Iranian opposition leaders. Reports about allegations of continued mistreatment of detainees arrested in last year's post-election protests have steadily surfaced in the media and among human rights groups. In late August, Iran's prosecutor-general, Gholam-Hossein Mohseni-Ejei, suspended three high-ranking judiciary officials over mistreatment of detainees at Iran's Kahrizak detention center, according to Iranian media reports. Several other prison officials were also accused of involvement in the deaths of at least three detainees in the facility, the reports added. Momeni's letter alleges repeated abuse he has been subject to since his July 2009 jailing, including having his head stuck down a toilet bowl, constantly being threatened with execution and being beaten until losing consciousness. His crime? Demanding democracy and reform for Iran, he wrote. "The iron fist of interrogators would often result in my passing out," he alleged. "On several occasions the interrogator strangled me to the point of me losing consciousness and falling to the ground. For days following these strangulations, I suffered such severe pain in the neck and throat area, that eating and drinking became unbearable." Hadi Ghaemi, the campaign's spokesman in New York, called on the Iranian authorities in a statement to probe allegations of torture and abuse by detainees and now allow for impunity. "If Ayatollah Khamenei does not respond by launching a credible and independent investigation aimed at holding violators accountable, then there is ample evidence that these systematic and inhumane methods for extracting false confessions are sanctioned by him," Ghaemi said. 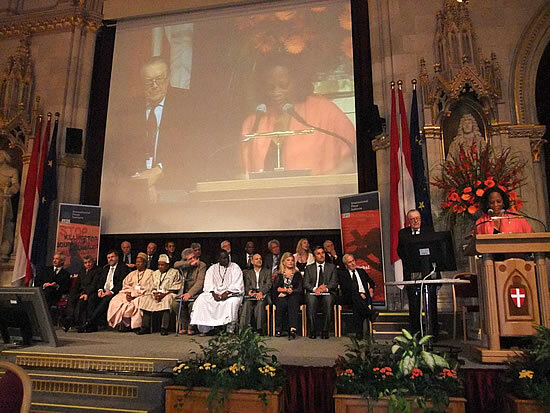 Akbar Ganji was chosen as the " Hero of The World Press Freedom" and on September 13 he received the award in a ceremony in the City Hall in Viena ! I would like to thank IPI for electing me as one of the recipients of World Press Freedom Hero Award. But I would also like to announce that this award belongs to all those who are now suffering under inhuman conditions in the prisons of the Islamic republic of Iran. Their only sin is their peaceful political thoughts and actions. We are dealing with a regime that does not recognize freedom of thoughts, freedom of expression, or freedom of peaceful gathering and denies its own citizens their constitutional rights. Those journalists who publish the truth in this regime will end up seeing their papers shut down, losing their jobs, and ending up spending long terms in prison. At the moment there are 26 journalists and 8 bloggers in prison in Iran--among them Ahmad Zeydabadi, Isa Saharkhiz, Ma'ud Bastani, Hengameh Shahidi, Bahman Amu'i, Kivan Samimi, Adnan Hasanpour, Hoda Saberi, Abdolreza Tajik, Sa'id Matinpour (journalists), and Mojtaba Lotfi and Ali Behzadnia (bloggers).This award is a sign of moral support for all imprisoned journalists and for that reason is of particular significance for me. Once again, thank you! The illegitimate regime that rules over Iran has spared and does no spare none of the social strata or social components from its systematic repression. A tyrannical and absolutist Sultan intervenes in all aspects of government and directly issues the orders to oppress the people. The people in position of responsibility in this regime will have to be tried and condemned in the International Criminal Court for crimes against humanity. The democratic movement in Iran is directed towards a democratic system, that is pluralist, secular, and committed to human rights and that under no circumstances allows the pushing the rights of racialized, religious, and sexual minorities into the dark dungeons of prejudice and inequality. The freedom of women is one of the principal components of this democratic movement. Women are today at the heart of this civil rights movement in Iran. Hosseyn Alizadeh Iranian diplomat in Finland who defected last Week: Ahmadinejad is not our president,dont take him serious! 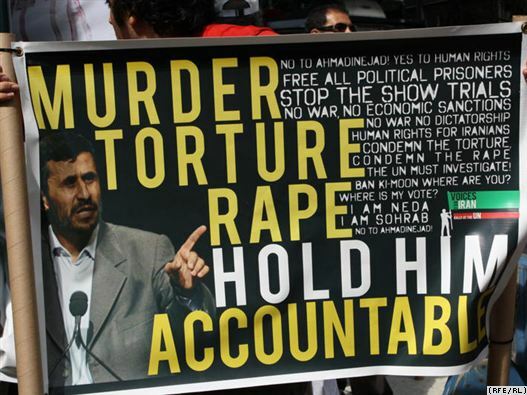 In a democratic Iran,ahmadinejad will be brought on trial for violation of human rights and crime against humanity! Faezeh Hashemi Rafsanjani, daughter of Iran's powerful Ayatollah Akbar Hashemi Rafsanjani and a prominent advocate of the Green Movement, speaks to Foreign Policy about the future of Iran's opposition and her (low) opinion of President Mahmoud Ahmadinejad. Faezeh Hashemi Rafsanjani, 48, was one of Iran's leading members of parliament from 1992 to 1996 and the founder and editor of Zan, Iran's first-ever daily women's newspaper. She is also the daughter of Ayatollah Akbar Hashemi Rafsanjani, one of the country's most influential men and strongest opponents of President Mahmoud Ahmadinejad. During the widespread protests that followed Iran's contested presidential election last year, Hashemi was a vocal supporter of the Green Movement and was briefly imprisoned by the Iranian government for her activism. She spoke to Omid Memarian about how Iran has changed since that election and the future of the Green Movement. Foreign Policy: During the post-election protests last year, you were imprisoned for 24 hours and then released. 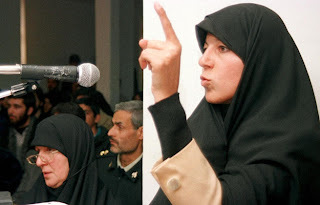 Many believe that, if you were not the daughter of Ayatollah Hashemi Rafsanjani, you would still be in prison right now. How has it felt over the past year to see so many of your former colleagues remain in prison? Faezeh Hashemi Rafsanjani: I, too, believe that I would not have been released had I not been Mr. Hashemi's daughter. It feels terrible to see individuals who have worked hard for this country for years put in prison without due legal process only for their attempts to stand up to injustice and for telling the truth. Likewise, [it feels terrible] to see those who are real criminals as rulers. Presently, everything is upside down, wrong is right, the unjust pretend to be unjustly treated, those who aim to destroy the country and the religion call themselves servants of the nation. Imbeciles are at the top, and managers and the distinguished are in prison, or have been dismissed, or have had to flee the country. All of this would be painful for any Iranian who has a modicum of pride. FP: Recently, Ahmadinejad has expressed interest in meeting with U.S. President Barack Obama. Considering his upcoming trip to the United States this month for the inaugural session of the U.N. General Assembly, do you think such a meeting might take place? And if so, how might this affect Iran's domestic politics? FHR: Ahmadinejad should handle his own problems first. Even if his own fabricated statistics are reviewed, everyone can see that over the 30 years [since] the Iranian revolution, even during the Iran-Iraq War, Iran has never had such a sorry state of affairs. He destroys whatever he touches. Whether the meeting takes place or not, I don't think anyone is waiting for any positive change in Iran's internal or foreign politics or putting too much hope on it. FP: How do you think Iranian society has changed since the June 2009 presidential election? FHR: The exuberance, hope, and excitement of the [post-election period] has given its place to depression and hopelessness. People see themselves face to face with lies, mismanagement, demagoguery, bullying, thuggery, injustice, destruction of national resources and wealth, loss of international opportunities, and further destruction of the country at the hands of the ruling group. FP: How would you define the Green Movement? What are its boundaries and what should be our expectations of it? FHR: I think every Iranian who is in search of his or her rights, freedom, democracy, and the country's development belongs to this movement. No regime can overcome on the will of Iranian people for change and freedom! 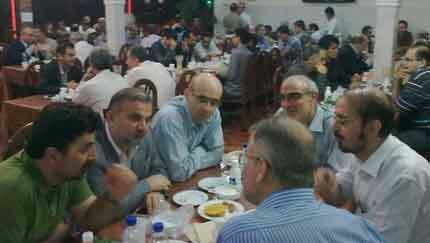 The picture above shows the reformists from the city of Rasht come together on an "Eftar" (a ramedan dinner ). 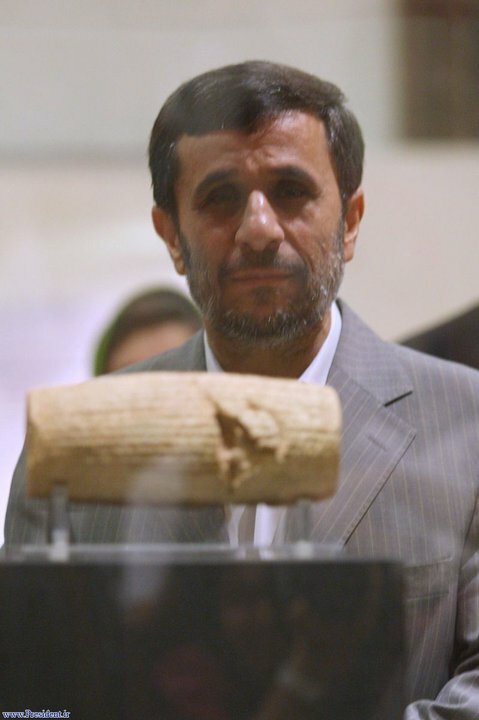 1-The ancient Persian Human Rights cylinder was brought back to Iran for public viewing! According to "Mehr" news agency , the human rights cylinder ( The first human rights charter) which was prepared by an order of Syrus the great on 539 BC was brought back from British musum (ancient Iran section) to Iran on Friday for exhibition. It is agreed between the British Musum and Iran Musum that; the cylinder will remain four months in Iran for public viewing.In the past only one time during the 2500 years celebration of Persian Kingdom the cylinder was brought to Iran for a few days. 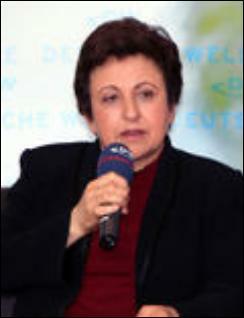 Shirin Ebadi speaking in European Parliament on September 9/2010 urged the European leaders to include human rights when dealing with Iran and nuclear issues, She also asked the European leaders to make effort and help to eradicate stonning and execution in Iran. In her speech she said: the campaign should aim to eradicate the execution and stonning , not just focus few cases , because at present there are many awaiting the same situation as the case of Sekineh Mohammadi. she believe that; despite of deaf ear by Islamic Regime in Iran on international protest against stonning and execution, we must continue doing the campaign about our values and the Islamic regime has signed the convention and is part of the convention so can't just ignor the protest. (1 September 2010) Authorities in the Islamic Republic of Iran are continuing to arrest and jail civil society activists while persecuting and prosecuting independent lawyers, the International Campaign for Human Rights in Iran reported today. “With a majority of Iranian human rights activists and lawyers already imprisoned or forced into exile, their remaining colleagues are systematically being taken down by the government of Mahmoud Ahmadinejad,” Aaron Rhodes, a Campaign spokesperson said. 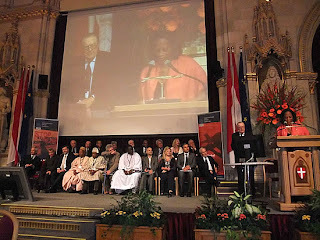 Shirin Ebadi, the 2003 Nobel Peace Prize Laureate, told the Campaign, “The Judiciary’s lack of independence is resulting in persecution of lawyers. If we look at the Judiciary’s approach during the past year, we see that lawyers defending political prisoners have all been targeted,” said Ebadi. Ebadi noted that prominent lawyers Mohammad Ali Dadkhah and Abdolfattah Soltani have both been imprisoned during the past year and released on large bails, Mohammad Seifzadeh is awaiting his trial, Mohammad Oliaeifar is serving a one year prison sentence, and Shadi Sadr and Mohammad Mostafaie have been forced into exile. Two members of the One Million Signatures Campaign advocating for gender equality, Fatemeh Masjedi and Maryam Bidgoli, have been sentenced to one year in prison. On 22 August, security forces arbitrarily detained human rights activists Hassan Asadi Zeidabadi and Ali Jamali. Prominent human rights lawyer, Nasrin Sotoudeh, has been summoned and her assets frozen. 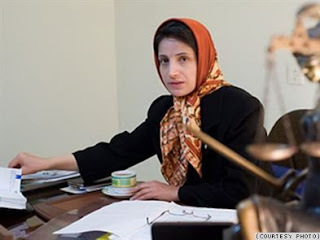 In an interview with the Campaign, Sotoudeh said that a new method of persecuting human rights lawyers by the authorities is to make unfounded financial allegations on tax grounds. “I was referred to the taxation bureau and while there I noticed in addition to my name, they are conducting special investigations into thirty human rights lawyers,” Sotoudeh told the Campaign. She noted that while human rights lawyers take on cases on pro-bono bases, authorities are using bogus tax charges to prosecute them. Sotoudeh said she believes these developments are aimed at putting an end to any legal defense by the human rights community. “The only institution capable of defending lawyers is the Bar Association, but the authorities are putting it under tremendous pressure and attempting to incorporate it into the Judiciary and take away its independence,” she said. With the arrests of Ali Jamali and Hassan Asadi Zeidabadi, almost all members of the Central Council of ADVAR, a student alumni organization devoted to human rights and social enhancement, have been arbitrarily imprisoned. ADVAR is a group of young Iranian citizens committed to improving the welfare of the people of Iran, and committed to peaceful methods and nonviolence to promote and protect Iranian citizens’ human rights. The Campaign is aware of no evidence that justifies prosecuting members of this group, and indeed, no such evidence has been presented in trials in which its members have been convicted and sentenced. The arrests and prosecution of ADVAR members have thus been politically motivated and at variance with Iranian and international law. The Change for Equality website reported that two women’s rights activists and members of the One Million Signatures Campaign, Maryam Bidgoli and Fatemeh Masjedi, were sentenced to prison terms of one year following their conviction on charges of “spreading propaganda against the state, through the collection of signatures for changing discriminatory laws and publication of materials in support of a feminist group (Campaign) which works in opposition to the Regime.” Both women denied the charges in their trial in the Second Branch of the Revolutionary Courts in Qom, explaining that the activities of the One Million Signatures Campaign are not in violation of any Iranian laws. Mina Jafari and Mahnaz Parakand, lawyers representing the women’s human rights defenders, plan to appeal the verdict. The Campaign expressed its serious concern over the abuse of judicial powers by Iranian authorities to target members of the human rights community and civil society activists. Palestinian Authority spokesman lashes out at the Iranian president who criticized Palestinian negotiations with Israel and PA President Mahmoud Abbas. A Palestinian Authority spokesman lashed out at the president of Iran for criticizing Palestinian negotiations with Israel and PA President Mahmoud Abbas in particular, Ma'an News Agency reported on Sunday. "The one who does not represent the Iranian people, who falsified election results, who oppressed the Iranian people and stole authority has no right to speak about Palestine, its president or its representatives," Abbas spokesman Nabil Abu Rudaineh said about Iranian President Mahmoud Ahmadinejad. The Ma'an News Agency reported that he also said Mahmoud Abbas was a hostage of Israel who lacked the legitimacy to negotiate on the Palestinian's behalf. "President Mahmoud Abbas came to power through free, democratic and authentic elections supervised by more than 2,000 international and Arab monitors," Abu Rudaineh said in response. "We are the ones who fought for Palestine and Jerusalem ... the Palestinian leadership did not oppress its people as did the Iranian leadership under Ahmadinejad." Last week, Egypt canceled a visit by Iran's foreign minister to protest comments he made accusing Arab leaders of betrayal for attending the new round of Mideast peace talks in Washington. Iranian Foreign Minister Manouchehr Mottaki had been scheduled to visit Cairo for a meeting of Nonaligned Movement members. "Some leaders ... who follow America's orders must understand that they are betraying their nations," Iran's Fars news agency quoted Mottaki as saying. (CNN) -- The administration of Palestinian Authority President Mahmoud Abbas lashed out at Iranian President Mahmoud Ahmadinejad on Saturday, a day after Ahmadinejad criticized Abbas for renewing direct peace talks with Israel. "He who does not represent the Iranian people, who forged elections and who suppresses the Iranian people and stole the authority, is not entitled to talk about Palestine, or the President of Palestine," said Nabil Abu Rudeineh, a spokesman for the Palestinian Authority, according to Wafa, the Palestinian Authority's news agency. Ahmadinejad, speaking to thousands of people at Tehran University on Friday, said the Mideast peace talks would fail. He spoke on Quds Day, an annual holiday in Iran that marks the country's solidarity with Palestinians and calls for the end of Israeli occupation. Abbas and Israeli Prime Minister Benjamin Netanyahu met for direct talks in Washington this week, pledging to move the peace process forward. After two days of meetings, they deadlocked over the contentious issue of Israeli settlements. "The fate of Palestine will be determined on the ground in Palestine," Ahmadinejad said Friday. "Not in Washington, not in Paris, and not in London." "These talks are death," he said. "There is no reason to hold talks." Rudeineh, the Palestinian Authority spokesperson, defended the Abbas administration's legitimacy among Palestinians. "We have fought for Palestine and Jerusalem and the Palestinian leadership has provided thousands of martyrs and tens of thousands wounded and prisoners (and) did not repress their people, as did the system of Iran led by Ahmadinejad," he said, according to Wafa. The Palestinian Authority has taken a stand against Iran, after the Islamic Republic criticized the PA for relaunching direct talks with Israel, according to official PA news agency Wafa.Palestinian President Mahmoud Abbas's spokesman, Nabil Abu Rudeineh, reportedly said that Ahmadinejad "does not represent the Iranian people, forged elections, suppresses the Iranian people and stole the authority. [He] is not entitled to talk about Palestine, or the president of Palestine." "President Abu Mazen [Abbas] is the elected president of free and fair elections in which more than two thousand international observers [participated]," Abu Rudeineh said. "We have fought for Palestine and Jerusalem, and the Palestinian leadership has provided thousands of martyrs and tens of thousands wounded and prisoners. ""We did not repress our people, as did Iran led by Ahmadinejad," Abu Rudeineh added. "We are defending our national rights and our national interest, and the President and the Palestinian leadership and the PLO are the sole legitimate representative of the Palestinian people, who knows how to defend their rights and will not allow anyone to undermine the national president or the legitimacy of the Palestine Liberation Organization," he said. The criticism came from Libya, where Abbas is meeting with Libyan leader Muammar Qaddafi.Earlier this week, Egypt canceled a visit by Iran's foreign minister to protest comments in which he accused Arab leaders of betrayal for attending the new round of Mideast peace talks in Washington.Iranian Foreign Minister Manouchehr Mottaki had been scheduled to visit Cairo Monday for a meeting of Nonaligned Movement members.Mottaki said Arab leaders who attended the relaunch of Israeli-Palestinian peace talks in Washington this week were "betraying their nations." "Some leaders ... who follow America's orders must understand that they are betraying their nations," Iran's Fars news agency quoted him as saying on Tuesday.AP contributed to this report. Regime in Iran and the fears of green movement continue..
1-For the past weeks until now ,once again regime reorganized its militia and repressive machinery to suppress the same people which brought them in power 32 years ago. At that time, the people wern't called enemy , but now they openly being called as enemy or rascals and regime is prepared and armed to teeth to do everything to stay a little more on power. How many more years they will have chance to run the country, no one knows, but surely it won't be long , if a year ago 4 millions people poured into the streets just in the capital city of Tehran , tomorrow definitely more people will join the protest against this regime. So the nightmare will stay in the beds of all regime officials for now. 2-As the " ghods " day of protest was approching , people called for protest against this regime and Karoubi one of the leader of the green movement said; he would participate in the protest , this brought fears among the regime officials and the regime's rogues attacked Karoubi's home almost every day for the last week. They have caused damages to the house and one of the body guards of Karoubi was hurt and was transfered to hospital . The rogues were chanting slogans such as "death to Karoubi", As a result of this karoubi's wife wrote an open letter to Khamenei for the consequences, Mr. Mosavi sent a message of support for Karoubi , leaders in the reformist movement and green movement sent their support as well. 3-"Ayatollah Mohammad Taghi Mesbah Yazdi" known as ayatollah " Temsah" or corocodile one of the hardline clergy in the Islamic regime and a supporter of Ahmadinejad government last Tuesday speaking to people in Khamenei's office ,once again attacked the leaders of the green movement and called them "Mahareb" meaning those who fight with god and he said "in the execution of Islamic laws, there is no space for democracy and human rights." . He is saying this while he travels to Canada to visit his son who lives in Waterloo and is a student of Waterloo University. 4- Today (Saturday) regime's judiciary brought Shiva Nazarahari a journalist and human rights advocate , who worked tirelessly for the street childeren to the court and on Friday Iranian all over the world gathered in protest against the regime and in support of Shiva who is sentenced to death by the kangaroo Islamic court.shiva was brought from Evin prison to court. Shiva has spent more than a year in prison now.